Jonathan Hollander, president and artistic director; founder and choreographer of the US-based Battery Dance Company, is more than an inspiration for every dancer around. In 1982, he created the Downtown Dance Festival (now renamed Battery Dance Festival) which is known to have become New York City’s longest-running dance festival. After decades of collaborations with Indian art forms, he thinks that there is still a lot left to be explored. He has hosted Indian artistes such as CV Chandrasekhar, Mallika Sarabhai, Swapna Sundari, Rama Vaidyanathan, and Arjun Mishra at the Battery Dance Festival in New York. He recalls, his outlook towards dance began and grew as a 16-year old exchange student, when he stayed in Mumbai with the Mehta family who were known for their philanthropy and their love for dance which introduced Jonathan to Sarabhais of Ahmedabad, the Manipuri Jhaveris of Mumbai, and Bharatanatyam exponent Sucheta Bhide-Chapekar of Pune. 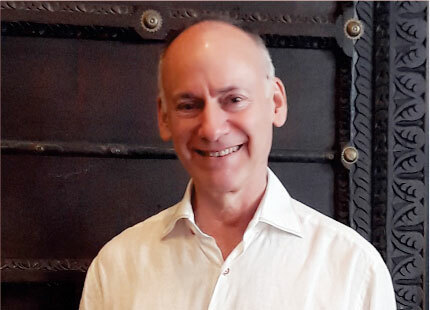 He established arts education residencies at the primary, middle and high school levels in New York City public schools; and served as Fulbright lecturer on dance in India in 1992, and Fulbright Specialist in Malaysia in 2011. Notable performances of Hollander’s works have been presented at Lincoln Center, Beijing International Modern Dance Festival, Taipei Arts Festival, Open Look Festival in St. Petersburg, Stockholm’s Moderna Museet, Alexander Theater and Tampere Biennale in Finland, among other noted festivals around the globe. The company has an inspiring project called ‘Dancing to Connect’ in countries such as Iraq, Congo and countries where there are dents in the society. It helps the participants, who can be non-dancers, to find the dancer within and thus create a balanced mind which might help in making a peaceful society. The workshops take the participants into a realm where they can overcome such divisions that otherwise create fear, hatred, racism and inequality. In India too, they worked with survivors of human trafficking and gender abuse. The joy of seeing these people reclaim their bodies and enjoy the movement is the biggest motivator for this project! The Battery Dance Company recently toured India with their new production, Shakti, inspired by Raag Durga, the work is the product of a collaboration with Indian classical dancer Unnath Hassan Rathnaraju. The production required the classical trained dancer to let go of his rigid form and use his body in a way he will never do in classical style, whereas, the contemporary dancers had to give enact a small drama piece and perform on Indian classical music, which they never would have done otherwise. It was done without any preconceived notions of what the results might be and attempted to expand the boundaries, get them out of their comfort zones, which was very risky, and allow unexpected discoveries to be made. It was worth the risk! # Dance…how did it start? I didn’t receive any early dance training. I danced the way I could most of it being folk and social dancing. I didn’t have the opportunity to go to a formal dance class and train until I was 18yrs, which was very late. But once I started, it was like a drug. I was addicted to it. I loved the practice and felt something different as I had a short attention span for other activities that I was learning, like piano, but unlike that I enjoyed every bit of dancing. I remember at one point I felt frustrated as I had started very late and wanted to go to a dance monastery where I could just put away everything else in life and concentrate on training, because that’s how I felt about it once I discovered it. The form of dance which I do is western, American, European style of contemporary dance which was evolved from Modern dance. The pioneers of modern dance are Martha Graham, Isadora Duncan, Mary Wigman in Germany. The dance forms which came after that classical period are called Contemporary dance forms. One way to learn contemporary form is to basically work with a choreographer, as each one has his/her unique style of movement. It is not like classical ballet where there is fixed vocabulary. One has to explore and find your style. I had a scholarship with Mercier Philip (Merce) Cunningham, a famous American chorographer, for 3 years and was fortunate to work with renowned choreographers later. At the age of 24, I decided to form my own dance company and create a mission and aesthetic value for dance….and I did it! The company auditions for new dancers but also the ‘word of mouth’ is equally important to get in good dancers. Each dancer whether referred to or new has to go through an audition. Male dancers are difficult to find as they are fewer in number as compared to the female counterparts. The process of creating any production is a symbiotic process between me and my dancers. The work is created somewhere in the air between us! It used to be in the olden days where I use to predetermine/decide everything and then bring in the dancers and teach them in a traditional way but that changed a long time ago. Now the process is more of a synthetic one and whatever we create is more of a collaboration. I have studied classical piano for 13years and very immersed in music as my mother was a concert pianist. The musical family background has given me the foundation for having the choice of music, the inspiration by music as a fundamental part in whatever I have done so far. That is why it is very critical that every dancer of the company has to have a musical ear, or else I cannot work with them. The creative process in my style of dance is very intuitive and organic meaning that you make one decision and everything else follows from that. It is based on 40years of experience. It is not like the architecture of a building where every detail is chalked out even before you dig a hole in the ground. The people who have no dance background are scared and worried that they are missing something, or they are not intelligent enough with their approach to it which creates some sort of insecurity in them as audience and they feel unliberated. That is the problem. The first thing that needs to be done is to liberate your thoughts and have an open mind without any preconceptions. It is hard to do that for trained dancers as they think of dance as a rigorous lexicon of movement whereas in contemporary we do not have a dictionary of terms… we are creating it with every movement! While seeing, one should try and feel the dance in their heart and what strikes them in a particular movement or a dance piece. U as a human being, does the piece say anything to you? Does it evoke any emotion? Does it remind you of anything? Does it hook you? Even if you are not a trained dancer there are other dimensions which may speak to you, like music, sets, lights which can make you experience the beauty of the piece. Working with Unnath for ‘Durga’ was a great experience. It was extremely hard for him in the beginning as the dance required a lot of fluid movements against the rigidity he was used to. He worked extremely hard on himself, with some coaching from me and the other dancers, on the basics and years of yoga practice made it possible for him. He was our choice because he was ready to start from scratch, to break his boundaries and ready to explore with an open mind. His humility and readiness to try something new made working with him very comfortable. He believed in himself and that made him come out of his awkwardness and trust the person who is directing. On concluding note, India has become very receptive of contemporary dance form. When we came 25 yrs back, whatever we did was all alien, but this time due to more exposure to different dance forms, thanks to the internet, the students and audience are ready to take a dip in the unknown waters!